In March this year, the Sarjeant Gallery Queen’s Park closed to the public for the transition project to begin. Visitors might remember one of the last shows held at the Gallery was Joan Grehan 1920 – 2007 (on display at the Sarjeant Gallery, 9 November 2013 – 2 March 2014). Grehan was a prolific artist born in Whanganui in 1920. Throughout her lifetime, she travelled and lived all over the world, before returning to her home town, Whanganui, in 1996. In 2007 she died quite unexpectedly, and the Sarjeant Gallery was bequeathed many works on paper from her vast portfolio by her estate. These works, around 450 of them, are the latest additions to the Sarjeant Gallery’s collection, which now consists of over 5,500 artworks. 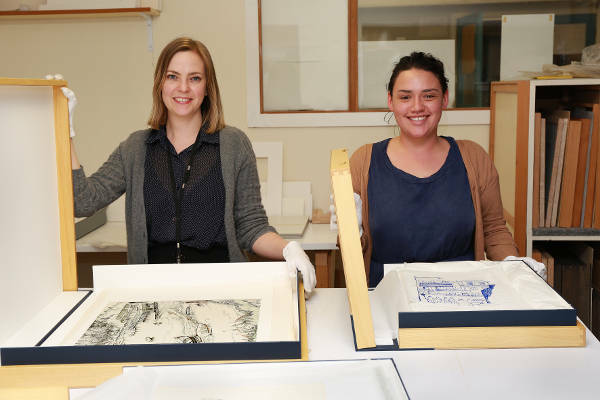 For the Grehan works on paper, it has been a case of last in – first out. They are the latest works to be catalogued in the Gallery’s collection management system, Vernon, but also happened to be the first works placed in our brand new solander boxes, which were purchased with funds kindly donated by Members of the Sarjeant Gallery. Placing the works in these custom-made archival boxes is the first phase in their relocation down to our brand new gallery and collection store at Sarjeant on the Quay. Cataloguing Grehan’s works on paper has been like taking a trip around the world for my colleagues and I. There are drawings made in pencil, charcoal, ink, watercolour and pastels from her time travelling around Cyprus, Uganda, Lebanon, Rome, France and New Zealand, including Bay of Islands and of course Whanganui. From a collection management perspective, we have found these works extremely interesting for their diversity of subject matter (from kittens to bustling market places to stylised figure studies), and also the varied techniques, styles and drawing materials Grehan utilised. For now these works are all tucked up safely, awaiting their big trip from the Sarjeant Gallery Queen’s Park, to their new temporary home at Sarjeant on the Quay. Even though these works were last in and first out, they’ll now be housed in improved conditions which will ensure they’ll be around for the enjoyment of our gallery visitors for many years to come.